Albania is a Mediterranean country in southeastern Europe. east, and Greece in the south, has a coast on the Adriatic Sea in the west, and a coast on the Ionian Sea in the southwest. The country is an emerging democracy and is formally named the Republic of Albania (Albanian: Republika e Shqipërisë). Official language: Albanian ("Shqip" or "gjuha shqipe" in Albanian). It should be noted that Albania is a name given to the country by foreigners. In the native language, Albania is called Shqiperi (meaning "eagle's nest"); Albanians themselves are called Shqipetare and the language itself Shqip. We first learn of Albanians in their native land as the Arbanites of Arbanon in Anna Comnenas' account (Alexiad 4) of the troubles in that region caused by the Normans during the reign of her father Alexius I Comneus (1081-1118). In the History written in 1079-1080, Byzantine historian Michael Attaliates was first to refer to the Albanoi as having taken part in a revolt against Constantinople in 1043 and to the Arbanitai as subjects of the duke of Dyrrachium. The Albanian name of the country, Shqipëria, translates into English as "Land of the Eagles", hence the two-headed bird on the national flag and emblem, and because of the large presence of these animals in the mountainous zones of Albania. Albanian names, like all nouns, appear under two forms "indefinite" and "definite". Hence Tiranë/Tirana, Krujë/Kruja, Elbasan/Elbasani, Durrës/Durrësi, etc. The definite form is the equivalent of adding the article "the" in front of the noun. The common scholarly usage is to mention feminine names in the definite form, while the masculine are mentioned in the indefinite: Tirana, Kruja, Elbasan, Durrës, etc. Since Albanian territories have long been under foreign rule, historical documents may mention Albanian place-names in their Greek, Latin, Italian (Venetian), Turkish, Slavic, or even French versions. For instance, Durrës has been called Dyrrachion, Dyrrachium, Durazzo, Draç, Drac and Duras. Another source of confusion from historical sources may come from a transformation of "-n-" into "-r-", called "rhotacism", which took place in the Southern (Tosk) dialects and prevails in the literary language. Hence, the Greek/Latin "Avlona" which gave the Italian Valona" is now "Vlora". In the area that is today Albania, human activity has been present since the beginning of human history. The earliest inhabitants were probably part of the pre-Indo-European populace that occupied the coastline of most parts of the Mediterranean. Soon, these first inhabitants were overrun by the Proto-Hellenic tribes that gradually occupied modern-day Greece, southern Macedonia and the southern part of present-day Albania. This process was completed over the second millennium BC and did not really affect northern or central Albania, an area that at the time presented the image of a political vacuum (in essence a historical paradox). Illyrians were relative late comers to the Balkan arena. Though their presence can be traced back to 900 BC, their political structure was formulated in the 7th and 6th centuries BC. Greek influence was spread further by the presence of several ancient Greek colonies along the Albanian coast. Albania became part of the Roman and Byzantine Empires before succumbing to a wave of invaders in the Middle Ages, losing most of its original population and finally becaming a part of the Ottoman Empire in 1478. Although its most famous leader Gjergj Kastrioti Skenderbeg, the Albanian National Hero, put up years of resistance to Ottoman rule, the Ottomans nonetheless secured control of the country and held it for the next 450 years. During this time, many of its people were converted to Islam. In 1914, the great powers agreed to try and unify Albania under a neutral prince, but Prince William of Weid proved an unsuccessful leader and came into conflict with his War Minister, Essed Pasha (a former warlord who had ruled much of central Albania). Essed was supported by Italy and Serbia and the prince by Austria-Hungary, and the resulting rebellion saw Essed flee to Italy, then return as his men beseiged Prince William in Durrës. Prince William left Albania in September 1914, only six months after his arrival, while bands of Greek bandits effectively ruled the south of the country. During World War II, the Italians tried to invade Greece from Albania in October 1940. The invasion was a fiasco that had to be rescued by the Germans, whose invasion of Yugoslavia in April 1941 enabled Italy to annex the Albanian-inhabited territories of Kosovo and Western Macedonia. The Albanians resented Italian occupation but generally welcomed the incorporation of the Albanian-inhabited parts of Yugoslavia. As a result, a violent form of fascism set in most of the country, especially in the northern provinces. The Italians and later the Germans - who had occupied northern Kosovo in 1941 as part of a rump Serbian state and took over in Albania after the Italian capitulation of September 1943 - found some collaborators to fight local nationalist and communist insurgents. The collaborators were of limited use, however; the "Skanderbeg Division" of the Waffen SS had under three thousand men, with low morale and discipline. The Albanian Communist Party, created by Tito in 1941 and led by the Serbs Dusan Mugosa and Miladin Popovic, had few followers among the Albanians and achieved little until the Germans retreated in 1944. It took over the country in November 1944 under the leadership of Enver Hoxha. Tito intended to include Albania, with Kosovo, in a Yugoslav and possibly Balkan federation, but the Albanian Communists followed Stalin as they broke with Tito in June 1948. After its break with Yugoslavia, Albania remained a client state of the Soviet Union. Following the Soviet Union's rejection of Stalinism beginning in 1956, Albania turned away from Moscow and found a new benefactor in the People's Republic of China. When China ended its international isolation in the 1970s, Albania turned away from its Asian patron as well, and adopted a strict policy of autarky - aiming to cut itself off from the rest of the world. The paranoid Hoxha feared invasion from both the West and the Warsaw Pact and responded by building over 700,000 concrete bunkers across Albania, costing more than twice as much to build as France's infamous Maginot Line. In 1985, Hoxha died and Ramiz Alia took his place. Initially, Alia tried to follow in Hoxha's footsteps, but Eastern Europe was already changing: Mikhail Gorbachev had appeared in the Soviet Union with new policies (glasnost and perestroika). The totalitarian regime was pressured by the US and Europe and the hate of its own people. After Nicolae Ceausescu (the communist leader of Romania) was executed in a revolution, Alia knew he would be next if changes were not made. He signed the Helsinki Agreement (which was signed by other countries in 1975) that respected some human rights. He also allowed pluralism, and even though his party won the election of 1991 it was clear that the change would not be stopped. In 1992 the general elections were won by the Democratic Party with 62% of the votes. In the general elections of June 1996 the Democratic Party tried to win an absolute majority and manipulated the results. In 1997 the fraud of the pyramid schemes shocked the entire government and riots started. Many cities were controlled by militia and armed citizens. This anarchy and rebellion caused the socialist party to win the early elections of 1997. Since 1990 Albania has been oriented towards the West, was accepted in the Council of Europe, is included in NATO's Partnership for Peace program and is a candidate to NATO membership. The workforce of Albania has continued to emigrate to Greece, Italy, Europe and North America. Albania is a Parlamentary Republic. The head of state is the president, who is elected by the Parlament,(called Kuvend in the native language), or the Assembly of the Republic of Albania. The main part of the Assembly's 140 members is elected every 4 years. 100 of the parliament's members are chosen by the people with a direct vote, while the other 40 members are chosen using a proportional system. Albania is divided into 36 rrethe (districts). Several districts are then grouped into a qark (county or prefecture), of which there are 12. 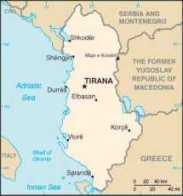 The capital city, Tiranë, has a special status. The districts are: 1 Berat, 2 Bulqizë, 3 Delvinë, 4 Devoll, 5 Dibër , 6 Durrës, 7 Elbasan, 8 Fier, 9 Gjirokastër, 10 Gramsh, 11 Has, 12 Kavajë, 13 Kolonjë, 14 Korçë, 15 Krujë, 16 Kuçovë, 17 Kukës, 18 Kurbin, 19 Lezhë, 20 Librazhd, 21 Lushnjë, 22 Malësi e Madhe, 23 Mallakastër, 24 Mat, 25 Mirditë, 26 Peqin, 27 Përmet, 28 Pogradec, 29 Pukë, 30 Sarandë, 31 Shkodër, 32 Skrapar, 33 Tepelenë, 34 Tiranë, 35 Tropojë, 36 Vlorë. It is bordered by Serbia and Montenegro in the north, and north-east, the Republic of Macedonia in the east, and Greece in the south, has a coast on the Adriatic Sea in the west, and a coast on the Ionian Sea in the southwest. Albania consists of mostly hilly and mountainous terrain, the highest mountain, Korab in the district of Dibra reaching up to 2,753 m.
The country has a mild, but generally wet climate. Albania after the communist regime was overthrown, as all the ex-communist countrieswas left with an obsolete industrial base and a pattern of industrial capacity wholly unsuited to its needs. Till '96 Albania's Growth Domestic Product was nearby 9% with a dynamic economy. But in 1997 the "Pyramidal Schemes" caused a regression of Albanian Economy. It is famous throughout the Balkans for its rich, sandy beaches. Until as recently as 2000, Ionian beaches were heavily populated but only by residents, with very few tourists. Between 1990 and 2000, the country went through political, economic, and social upheaval. Since then, however, Albania has had improving employment and decreasing corruption, which in turn has increased tourism. 95% of the population is Albanian, with a Greek minority of 3%. Over 600,000 Albanians have emigrated to Greece since 1990; many others have left for other countries. The language is Albanian, although Greek is also spoken by the Greek minority in the southern regions of the country. Since the occupation by the Ottomans, the majority of Albanians have been Muslim (70%), even though religion was prohibited during the Communist era. The Eastern Orthodox Church (20%) and Catholicism (10%) are the other main religions in Albania, though in Albania religious fanaticism has never been a serious problem, with people from different religions living in peace and even getting married without any problem.